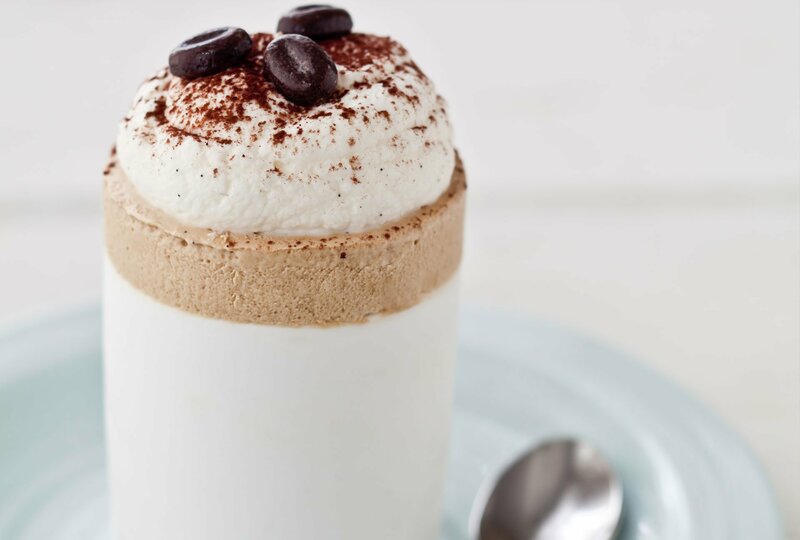 If you like smooth and creamy frozen treats, this iced coffee soufflé will please your taste buds. It’s a perfect dessert to serve as a refreshing treat on a hot summer’s day. To make the frozen soufflé look like a hot soufflé which has risen, wrap the outside of ramekins with a double layer of waxed paper, 3 cm higher than the ramekins (in order to increase the height of the ramekins). Secure with tape or kitchen twine. You must freeze this dessert for at least 2 hours before serving. Combine the egg yolks and sugar in a heatproof bowl and whisk until thick and pale yellow. Heat the water to 95˚C. Place the Lavazza Kafa Forest Ground Coffee in the cafeteria and add the hot water and allow to infuse for 2 minutes before pressing through the filter to remove the ground coffee. Add the coffee to the yolks and sugar mixture and combine well. Place the bowl containing the egg yolk mixture over a saucepan of simmering water (bain marie). Whisk until the mixture becomes creamy and falls like a ribbon from the whisk. Add the gelatine to the warm sabayon and stir until dissolved. Remove from the heat and whisk until the mixture cools. In a separate chilled bowl beat the cream until soft peaks form. Keep chilled. In a saucepan heat together the sugar and water, until it reaches 118˚C. Meanwhile whisk the egg whites in a very clean, dry bowl until they start to form soft peaks. Gradually pour the cooked sugar syrup onto the egg whites while continuing to whisk. Continue to whisk until the meringue is cool, smooth and glossy. Gently fold the sabayon and the Italian meringue together, then fold in the whipped cream, incorporating as much air as possible into the mixture. Immediately pour the coffee-flavoured sabayon into the prepared ramekin dishes right up to the edge of the paper collar. Smooth the surface of each soufflé and freeze until set, about 2 hours. Beat the cream in a chilled bowl until soft peaks form and the cream clings to the whisk or beater. Remove the paper collar from each ramekin. Top with whipped cream, dust with cocoa powder and garnish with chocolate-covered coffee beans.